My partner in creativity this year is Cynthia Tucker. Here is a link to her blog... Sea of Glass Beads (unfortunately she was unable to post at the time of the blog hop, but she will when she is able, so stay tuned). Meanwhile, here is a little reminder of what she sent me....and what I did with them. This first piece is created using Cynthia's beautiful ocean inspired beads. I netted a tiny bottle and filled it with little treasures that I found on our recent cruise to the Bahamas. This necklace is made from waxed Irish linen seed beads and a number of beads Cynthia created. Love it! This bracelet focuses on two of my most favorite things...the sea and the stars. The two colorful lampwork beads that Cynthia created is joined by the sterling clasp that was included in my soup. I hand stamped the "dream" focal and riveted it to more sterling. I also made a coordinating copper and resin heart charm. All happily joined with Mykonos star beads. I really wanted this adorable hollow fish bead to get all the attention it deserves so I chose to handcraft a steel chain. I added some of the coordinating lampwork spacer beads also made by Cynthia. I think he's adorable! The sea to my shore....words taken from a Sarah Mclachlan song that inspired this necklace. This was the focal that Cynthia shared with me. It has such beautiful colors and such depth. I forged copper rings, handstamped copper charms and added some pretty little stone chips and other glass beads. And last but not least! A pretty sun catcher just for me. I create these and sell them at the shows that I do through out the year. I never kept one for myself. This one is all MINE. I love the colors of these beads Cynthia made and chose to include in my soup. And I love how they catch and let the sun shine through. The drift wood is found on the Lake Ontario shoreline that I enjoy walking along in search of little treasures. Truly a work of love. Hope you enjoyed my addition to the party! Here is a link to the rest of the blogs...enjoy the rest of the party! And don't forget to wear your party hat! I know I am one of the lucky ones... this little guy proves it! She was crawling around on the table that I use to take pictures, next to my window. Only she and my pib (partner in beads) Cynthia Tucker knew what was waiting for me. I had a REALLY long day at work (I work at a DMV) and was especially excited and in a hurry to get home today to see that the mailman brought. WOW~ What a BEAUTIFUL surprise I received! I know Cynthia loves the sea, and it truly shows in every single bead she has made and shared with me. Beautiful, beautiful colors of the ocean! Sea for yourself! My soup was packaged so nicely in pretty colorful organza bags with a cute little Spring card. You can see by the snow in the background, Mother Nature has different plans for us here. All the better to get beautiful sea inspired beads! I can't wait to get to work with these cuties, especially the adorable fish! And the depth of the sea side focal is just fantastic! So, I definitely think I'm the lucky one, and my lady bug friend agrees! Hope the rest of you are all as lucky! ME! Because my partner in beads this year is Cynthia Tucker. A fellow lampworker with the same love of the sea as me! I'm excited! Here is a link to Cynthia's ETSY shop, so you can sea (haha) her awesome work for yourself. I jumped in...and can't wait! Hi Bead Soup Party blog hoppers! Her soup included lots of colorful polymer clay beads made with her own hands. And here is what I created from them. My first piece I used the pretty polymer clay, stone, wood and bone beads in the earthy tones that Emma sent. I etched copper sheet with an original hand drawn birdie to serve as a focal, hanging from copper seed beads. 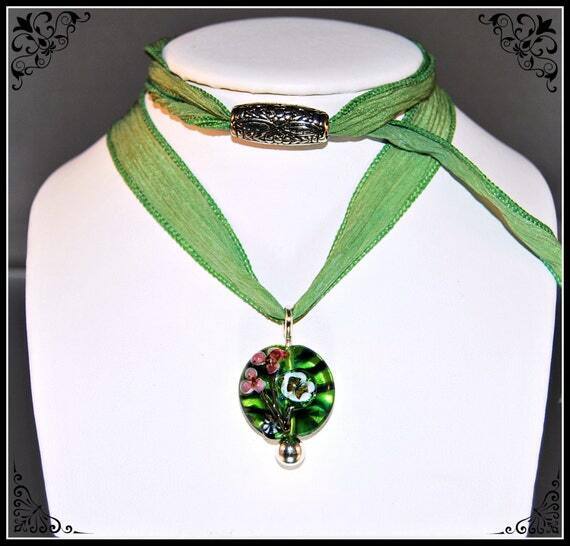 Tea dyed silk ribbon and a hand crafted copper clasp finish it off. I wore this piece to a party last weekend and got a lot of compliments. The second piece is comprised completely from Emma's polymer clay beads. I used waxed Irish linen and a few macrame knots to make this simple necklace with a tropical feel. I even used one of the polymer discs as a clasp.... I love the focal! I saw an orchid swirling within the colors. The third piece (Emma gave me A LOT of beads!) is made from more awesome stone beads, pretty coral color freshwater pearls, coordinating crystals, two of Emma's polymer clay focals, and the beautiful sterling clasp Emma gave me. I added a short length of sterling silver chain maille to finish it off. Beautiful peachy coral colors! And last....but not least. I used the "timberwolf" and "scarlett" colored Emmacrafted polymer beads (the color names came from her daughter's crayon choices) , dyed jade and the two pretty silvery open rings from Emma's soup. I added copper wire, silk cording that I dyed to match Emma's beads and some of my own gray lampwork spacers. All strung on waxed Irish linen cord that I dyed to match too! A fun piece that I can't wait to wear! I have to say that I really enjoyed working with all these different materials. It was challenging and fun! I'd like to say a huge thank you to Lori Anderson for hosting this creative endeavor. I can't imagine the amount of work she puts into each Bead Soup Blog Party. It is greatly appreciated! And most of all THANK YOU ~ EMMA! Thanks for visiting and enjoy the rest of your hop! Click here for a complete list of the 2nd Reveal! This is Maui...our kitty #2. She is two years old. I just fell in love with her eyes. She is afraid of her shadow! She loves to climb into things and sleep. I once couldn't find her and after searching for a long time discovered her in a cardboard box that had it's flaps all folded shut. She was sleeping in the clothing that was being stored inside. I have no idea how she even got into that tiny little opening. She was much more white when she was a kitten. The person that we got her from was afraid that we wouldn't want her because of the big dark markings across her face. My first thought was...OMG are people really that shallow? She is a beautiful animal! Even if she hadn't been, she deserves the same love and devotion as any other friend. 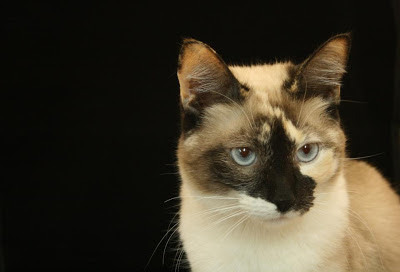 We named her Maui...well, because it sounds like "meow" and my husband and I had the once in a lifetime chance to go to Hawaii a few years ago for our 25th wedding anniversary and fell in love with Maui. Maui is very vocal...I have NO idea what she's talking about...but she talks A LOT! She also likes to push our little yorkie-poo out of his snuggle spot next to me. She is very passive aggressive that way. Well...that's kitty #2. Lucky to have her as part of the family! When I am done with my creations I am so going out to buy an outfit just to go with these yummy colors. Beautiful! Thanks so much Emma! Watch for the 2nd reveal on April 6th!